Atmospheric and beautiful soundtrack for long winter nights. Everything inspires me. From the weather outside to any success of my favorite bands. 5. The whole album "No Stars, Only Full Dark" is a statement for "to stop the exploition of our home planet". Are you active in environmental protection? I love our planet, its wildlife and wild places and I always try to protect the environment. You may not be in any environmental organization but at least you can throw garbage inside the cart. 6. It seems to me, that you have captured in your music some different aspects of nature: the strong power of nature which destroys, the frail side of nature which is so easily destroyed, but also the awesome beauty of nature. Which aspect of nature fascinates you most? And why? Both aspects fascinate me. They are opposite therefore they complement each other as they are balanced. They cannot exist without each other so it is necessary to keep a balance. 7. Neswa-Pawuk' is my favorite song on "No Stars, Only Full Dark". There is a romantic story behind this song and at least in my opinion you have captured perfectly well this "romantic" and "dreamy" vibe. Are you a romantic person? Yes, I am. We are all romantic persons but some people more, others less. 8. Was it difficult to write such a soulfull song? Or is it easier to write songs with are more straight-forward like 'No More Entry, No More Exit'? What do you prefer? It is not difficult at all. I just take a guitar in my hands and begin to play. I compose main and secondary melodies and combine them into a whole song. All the songs have been written in this way. 9. As in "Collision Of The Worlds" it sounds as if you use a musical clock. Just as in "No Stars, Only Full Dark" namely in the song 'No stars'. Maybe I am completely wrong, but for me this song has a very "innocent" and "pure" atmosphere because of this musical clock sound. What is this song about? You know there is a difference between what it means to me and how others interpret it. It is up to others to figure out what it means for themselves. 10. Is there a song on "No Stars, Only Full Dark' which is special to you? They are all special to me. 11. Compared to "Collision Of The Worlds" there are more lyrics on "No Stars, Only Full Dark" even if there are not plenty of words at all. Do you feel uncomfortable with doing the lyrics? How important are lyrics to WINDBRUCH at all? Lyrics are not important at all. Music begins where words end. 12. Are there plans to translate the Russian lyrics into English and publish them one day? I have no such plans. But if someone would happy to read the lyrics I guess I could try to make a translation. 13. WINDBRUCH is only you. Do you plan to extent the band? Perhaps for live performances? Maybe in the near future. 14. Have you ever played in other bands before you founded WINDBRUCH? Before I founded WINDBRUCH I played in one-man doom metal band ETERNAL WINTER which’s lyrics based on H.P. Lovecraft’s books. I recorded just a debut album then I founded WINDBRUCH. 15. Are you already working on new songs for the next album? I’ve begun work on my next release that is going to be a black metal act with strong amount of post-metal influence. 16. What's on top of the wishlist for WINDBRUCH in the future? To keep trying and never stop working. 17. I am at the end of my questions. I want to thank you for this interview and wish you lots of luck with "No Stars, Only Full Dark". Whatever you want our readers to know - the last words are yours. Thank you too. I wish everyone good luck. Be yourself and you can be anything. Windbruch - 'No Stars, Only Full Dark' available now! New Windbruch album - "No Stars, Only Full Dark" available now! Windbruch - No Stars, Only Full Dark available to pre-order now! HDR - 037 : Windbruch - No Stars, Only Full Dark available to pre-order now! Windbruch's new album "No Stars, Only Full Dark" is now available to pre-order for a lowered price of $6.00 plus shipping until the release date on February 1 at which point the price will go back to its regular $8.00 plus shipping, and the full album will be uploaded online. For the time being, two tracks from the album is available online! Windbruch signs with Hypnotic Dirge Records; Release of second full-length album "No stars, only full dark" in February 2014. Release of second full-length album"No stars, only full dark" in February 2014. 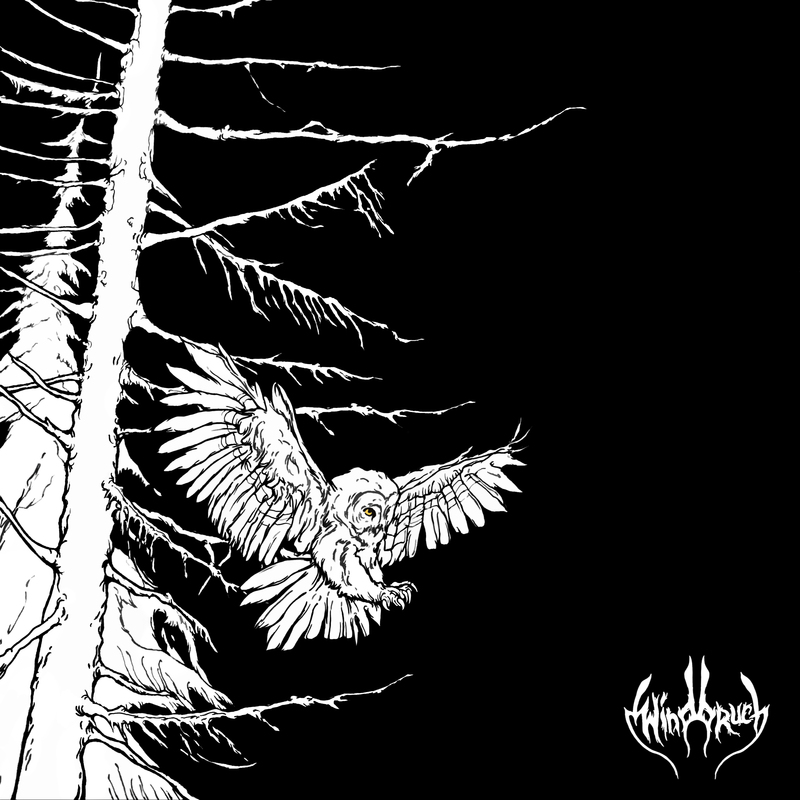 The atmospheric Black Metal project "Windbruch" has signed with Hypnotic Dirge Records for the release of their second full-length album "No stars, only full dark"